Call Recording Storage charges we have released two additional elements to help Partners understand what usage their clients’ are using and where they go to adjust retention periods to reduce storage usage/ charges. The two new elements are call recording usage reporting features that will show the quantity of GBs used for a Partners total customer base split by customer, plus an option at the customer Call Recording Group Level so that a business can track their own GB usage. Resellers can now access the “Call Recording Storage Snapshot” which will display the total volume of call recordings, both in terms of duration and size, for all customers, and also the chargeable element per customer. 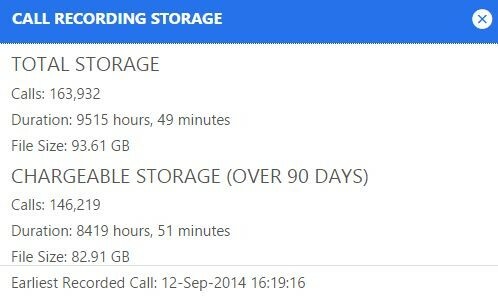 This report can be found under Reports > Calls > Call Recording Storage Snapshot. At Business Level, select the “Call Recording” group service in the Service Assignments and click the green “check usage” box and you will get a summary of that customer call recording consumption.